Since WOTC has yet to release a screen, I decided to make my own. 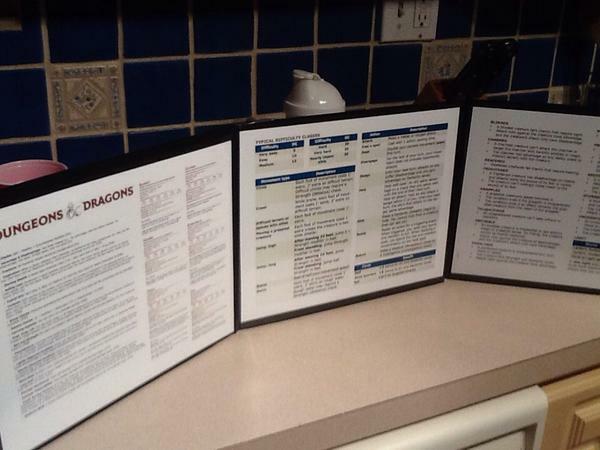 I bought a customizable GM Screen from Amazon recently, and printed out some charts and stuff I found online. One thing I did add to my screen now that 5e’s Bounded Accuracy makes monsters more threatening to PCs on a wider range of levels, is monster stats. I thought of a few generic enemies, like cultists, bandits, orcs, trolls, hobgoblins, etc, and added their stat blocks to one of the panels. In a pinch, it can come in handy. Random encounter during a night’s rest? I have a few stats handy in front of me. Here’s where I got the charts I used. Keep in mind I screen grabbed, manipulated, resized, etc. to come up with my layout. I am not going to make it available because the works weren’t originally mine. I will link to where I got the charts from instead. For the player’s side, I went old school and found some of my favorite older D&D art. Very cool! 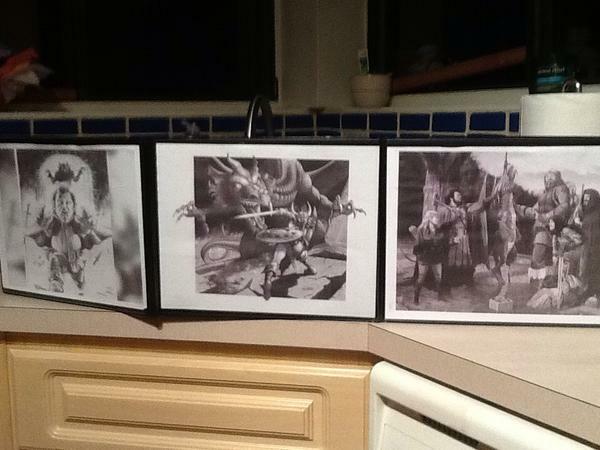 I have done something like that using the DM screen I picked up from the D20 Monkey kickstarter. 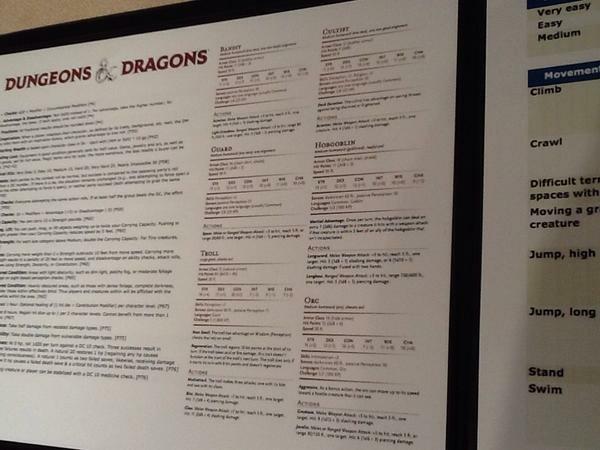 For what it is worth, Chris Perkins (in the Acquisitions, Inc. game) and Chris Tulach (at the special table for the EPIC Adventurers League adventure) used the new Gale Force 9 DM screen for 5E. It has really awesome cover art and the tables inside are all very useful (and have some fun small art in and around the tables). It looks to be a very cool buy for those that like using a screen. Can you remember what the tables in the GF9 screen were? Sweet idea! I think I’ll make my own heavily inspired by yours, but keep one of the three walls easily mutable, so that I can swap (paperclamps, perhaps?) which monsters are on display according to the adventure at hand. Lawyer question: If the rules content of the screen (not the artwork) was assembled by a third party (me for instance) instead of screengrabbed, would it be legal for me to share this with the world as a free download? I have the Food, Drink, and Lodging table but I might cut that or move it to the player’s side. Actions in Combat and Movement Types are good ideas; I’ll have to add those to mine. Once I’ve used it a couple of times, I’ll have better ideas of what I need and don’t need. Thanks for the great blog post. I just found your site and really like the idea for the DM screen. Would it be possible to have you PM a copy of the files you used to create your large version? 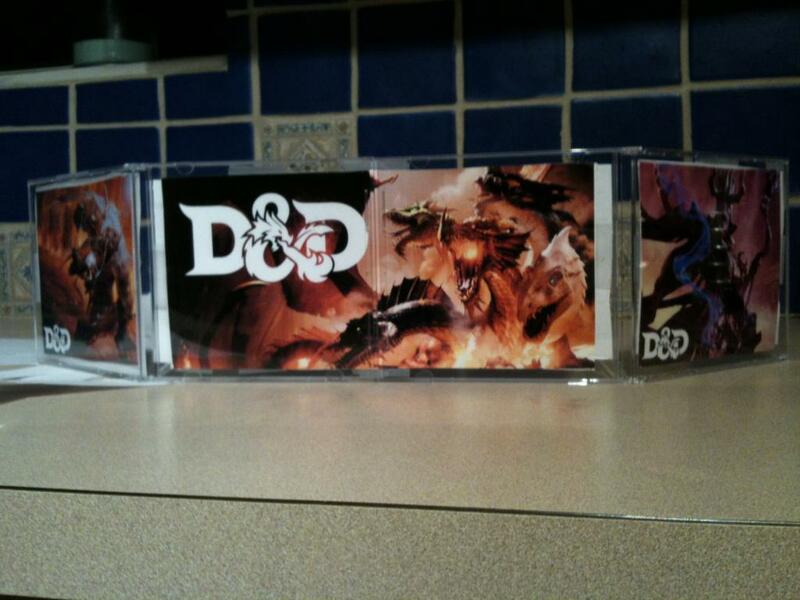 This would be a fantastic gift for our DM. 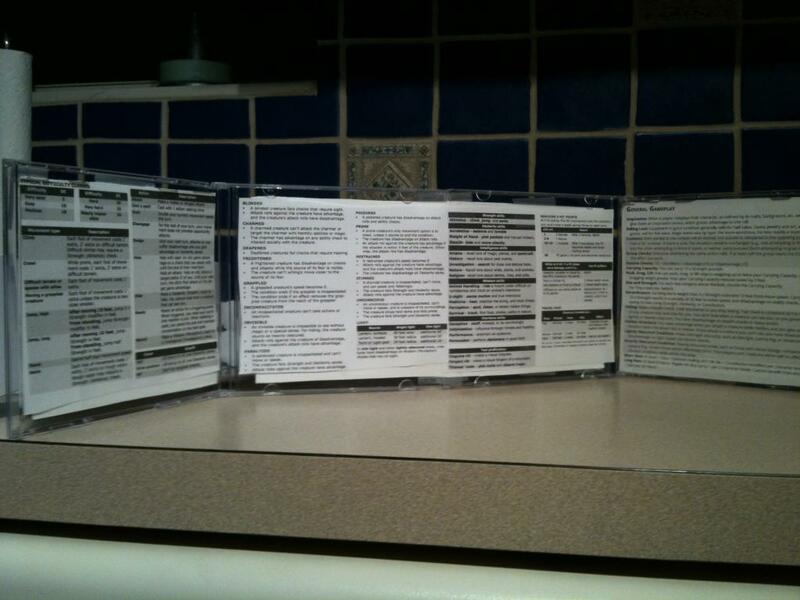 I would also love to see the soft copy for your three pane dm screen. I have the same screen and would really like to start our 5th Ed campaign (January) with a usable screen.